Here’s a tune from 1893, adapted slightly to create a miniature solfege study for young children. 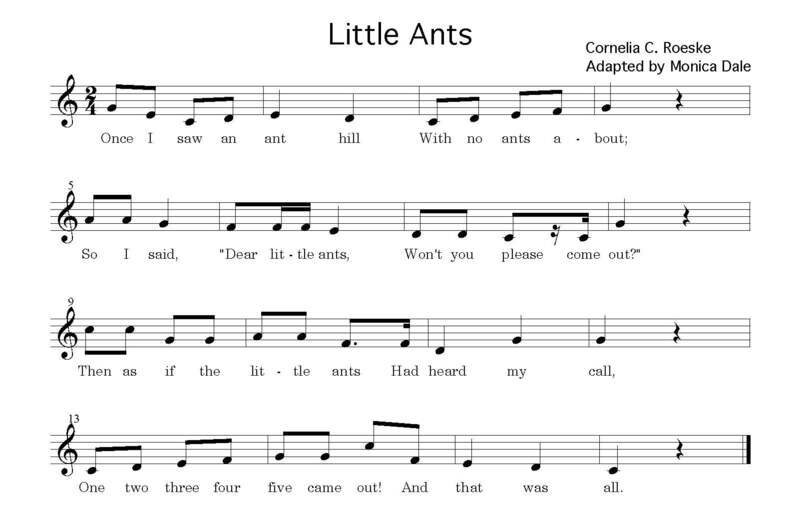 The song was originally designed as a fingerplay: closed hands make the ant hill; fingers open one at a time on the numbers. It’s still useful that way, especially for teaching finger numbers. As a variation, assign five children a number and have them huddle as an “anthill,” jumping out and singing their number at the appropriate time (singing the appropriate pitch). The ant hill could also be made of five hula hoops arranged in a close circle on the floor. Other children could play pitched instruments for the numbers, or a selection of five different percussion instruments, each assigned to a different pitch number.